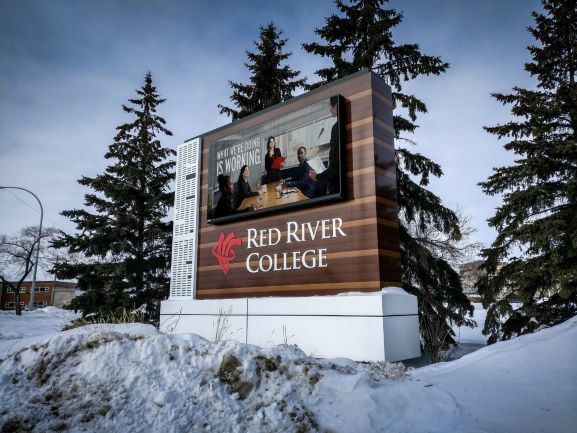 In the summer of 2018, Red River College put out a call to enhance the landscape of their Notre Dame Campus in Winnipeg, Manitoba. Continuing to market their advancement in Technology & Trades brought to life new buildings and structures for all to appreciate. Electra Sign answered that call and manufactured a complete solution including custom designed, LED illuminated monuments for each of the entrances of the campus. The largest of the 7 monuments include an 8mm Hi-Resolution colour electronic messaging system, which explores opportunities available at the College. Each structure compliments the new and recently renovated buildings. Red River College has eight campuses across Manitoba, including several located in rural communities. Their campuses include state-of-the-art equipment and facilities to ensure that students are ready for the workforce after graduation. Electra Sign now exclusively offers Watchfire’s high-resolution 8mm displays which are ideal for outdoor locations with significant pedestrian traffic, a nearby busy intersection or traffic congestion. The 8mm features a surface mount device (SMD) LED package designed to deliver vibrant images with high contrast. The closer your LED sign is to your audience, the greater the visual impact and messaging flexibility. Most importantly the signs electronics are rated from -40 °C to 60 °C to withstand our harsh climates winter and summer. Patented front ventilation, a slim cabinet, and beveled module edges offer near-seamless installation, even around curves. Every XVS 8mm sign includes live video capability, whole-sign color and brightness calibration, and automated sign diagnostics. These 8mm signs use a surface mount device (SMD) that contains red, green and blue under a single lens. This produces a high-quality display that provides exceptional resolution for crisp, vivid content and wide viewing angles. Every module is encapsulated to be ruggedly durable in all kinds of weather. Controlled thermal and mechanical stress is applied during Highly Accelerated Life Testing (HALT) to identify design weaknesses and opportunities for product improvement. Cabinets are rated for temperatures ranging from -40 °F to 140 °F. Extruded aluminum, precision-mitered corners, solid welds, and stainless fasteners make our cabinets strong yet lightweight and stand up to corrosion for years of worry-free performance. Average energy use equals about 1/3 of maximum amperage. All signs are UL 48 & CUL 48 listed and UL Energy Efficiency Certified. Displays are verified to be in compliance with FCC regulations regarding emissions interference. Burgers don't get much better than they do at Nuburger, and Electra Sign is privileged to work alongside a company that shares so many of the same values. Electra Sign provided the signage for their newest location at the southeast corner of Regent and Lagimodiere. But whichever of their four locations you stop at, their focus on quality ingredients and ethical practices is guaranteed to leave you feeling satisfied and guilt-free. Since opening their doors here in Winnipeg, Nuburger's menu offerings have drawn in burger afficianados from all over the world. Each burger is specially crafted, made and topped with only the freshest and most Manitoba-local ingredients possible, and designed to ensure both maximum health benefit and supreme flavour without compromise. Nuburger is a great place to grab a tasty meal that suits the new Canada Food Guide requirements, and will cater to just about any dietary lifestyle or need you could hope for. Are you on a keto-kick, or are you a carb-craver? An ardent vegan, or an unapologetic carnivore? Folks from all walks of life are sure to find a delicious new favourite here. To match their bold flavours and style, Nuburger wanted to make an impact with the signage for their newest location on Regent. Electra Sign met the challenge with extra-sized LED trimcap letters, accompanied by detail-oriented acrylic secondary copy. But the crown jewel is the custom-built push-thru heart logo that lights up at night and pulses to a heartbeat. It's a unique and memorable sign for a one-of-a-kind burger experience, and a project we were proud to work on. Connect with Nuburger online to get a taste of what you've been missing!